New Tenderstem® Frozen. Made with Tenderstem® broccoli picked and packed at its freshest, but frozen to lock in all the flavour and healthy stuff. Individually frozen stems mean you can use as much or as little as you like. Find out where to buy. Frozen Tenderstem® can be used just like the fresh stems – it’s perfect as a simple side dish or as a delicious addition to stir fries, salads, pasta sauces and curries. 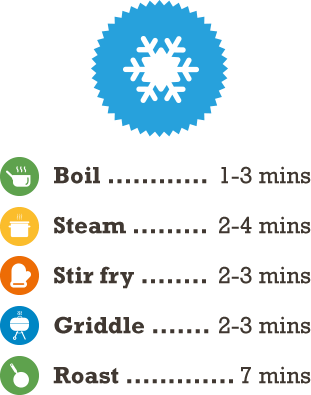 Recommend cooking from frozen, do not eat raw, do not re-freeze once defrosted, ensure the product is piping hot before eating.